Miss Mia Sopaipilla proves something of an impediment to the rumormongery from time to time. This entry was posted on December 13, 2018 at 5:38 pm and is filed under Bicycle Retailer and Industry News, Cartooning, Cats. You can follow any responses to this entry through the RSS 2.0 feed. You can leave a response, or trackback from your own site. I would not mess with that cat without buffalo hide full body chaps. And even then only if you gave me a 30 minute head start running in the other direction. PO’G: This has the makings of a feline Dilbert series from a Far Side perspective. Hope I’m not infringing on copyrights here. ?? Can’t you just see the admin/exec assistant who patrols (and has territorial rights over) the actual functional parts of the office (read internet, copiers, access to principals, coffee machines, etc.) with a “this is my empire and I own you here” (sort of like the feeling you get when going thru customs)? 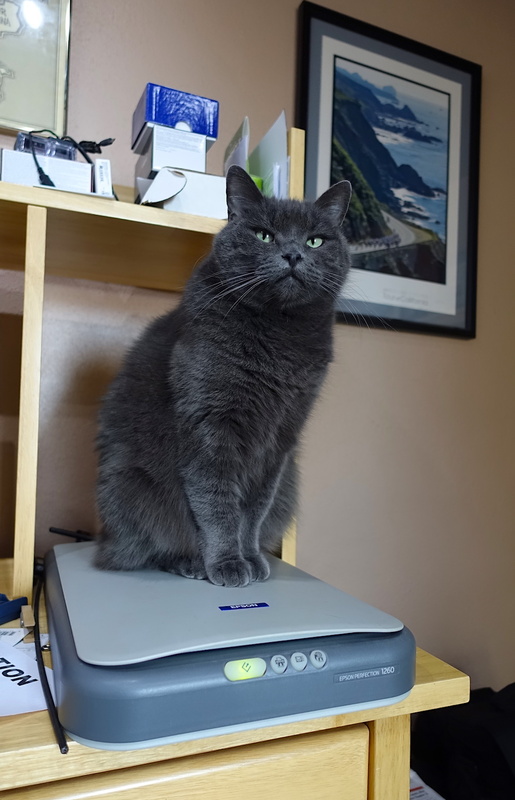 Catscan? Sorry, that is pitiful. The Duffinator and Mr. Boo approve of your patience with those other “animals.” If Duffy becomes the new chief of staff at the white house, someone’s pant legs would be wet and a little stinky most of the time. There is a large tabby male that roams these parts, so he gets a cup of food twice a day by the back door. It was cold enough the last couple days that my better half let him in. Our 14 year old fixed girl cat Maile chased him out of the house.